Sorry... the 2017 BMW i3 is no longer being sold as new. Instead, take the first step to a great deal on 2019 BMW i3 with a free price quote! 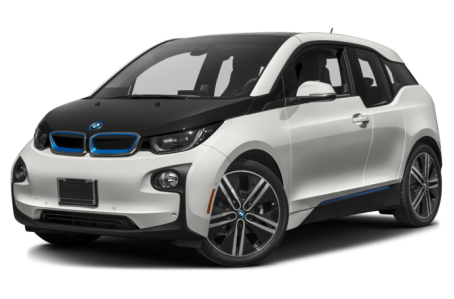 The 2017 BMW i3 is an all-electric, subcompact hatchback. It competes with the Chevrolet Volt and Nissan LEAF. Three years after its debut, the BMW i3 still has one of the most futuristic designs on the road. It starts with its two-tone, color-contrasting body, which has a playful mixture of geometric and organic lines. The use of blue-trim accents at the emblems, front grille, and bottom door lips gives it an overall sci-fi feel. BMW’s signature dual-kidney grille has been squared off on the i3. Half-sized suicide doors for the rear passengers keep the i3’s wheelbase short. Standard features include LED headlights, power/heated side mirrors, and 19-inch alloy wheels. LED daytime running lamps and a power moonroof are available as well. Under the hood, the i3 now has a 114-mile pure electric range with its 170-hp electric motor and a new 33 kWh lithium-ion battery mated to a single-speed transmission and rear-wheel drive. A 2-cylinder gasoline Range Extender gives the i3 an even longer range of 180 miles. Inside, the i3 has a premium cloth interior with a 50/50-split folding rear seat. It has a maximum cargo capacity of 39.6 cubic feet with the rear seat folded down. The center stack features the BMW Navigation System with a 6.5-inch display, Bluetooth connectivity for phone and audio, and a USB port. It can be upgraded with a Harman Kardon premium audio system. Standard features include automatic climate control, an automatic dimming rearview mirror, cruise control, remote keyless entry, and a Start/Stop button. Leather and/or wool cloth upholstery and wood trim are optional. Standard safety features include front air bags, antilock brakes, and an electronic stability system. The available Parking Assistance Package comes with a backup camera and multiple front and rear sensors for parking. Also optional are adaptive cruise control, forward collision warning, post collision mitigation, and pedestrian detection. 4 of 4 (100%) consumers said they would recommend this vehicle to a friend.